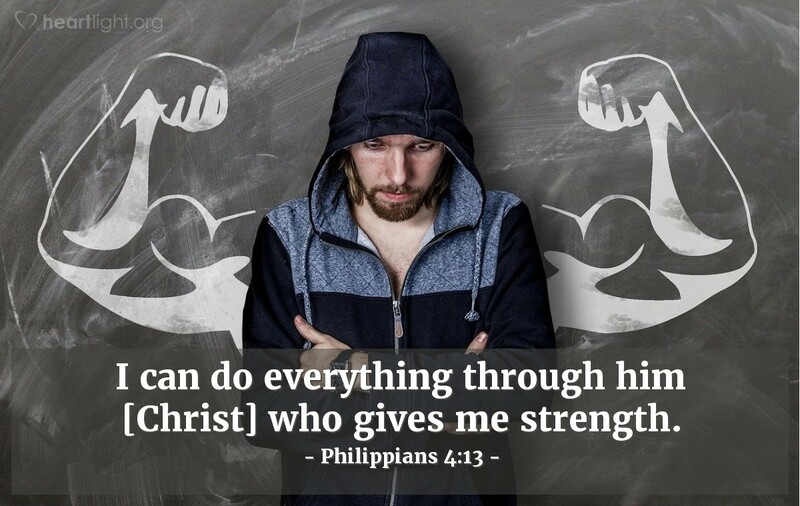 I can do everything through him [Christ] who gives me strength. I don't know about you, but I know I've grown soft and spoiled because of all the conveniences that I have allowed into my life. Could I honor God with my praises and thanksgivings if these conveniences were to suddenly vanish? I hope so. I want to be like Paul and live with the assurance that I can withstand any situation with the help of Christ. O God, without you my strength would fade and my confidence would fail. Thankfully I will never have to worry about this because your grace, your Spirit, and your Son will strengthen me and help me weather any storm. Thank you, in Jesus' name. Amen.